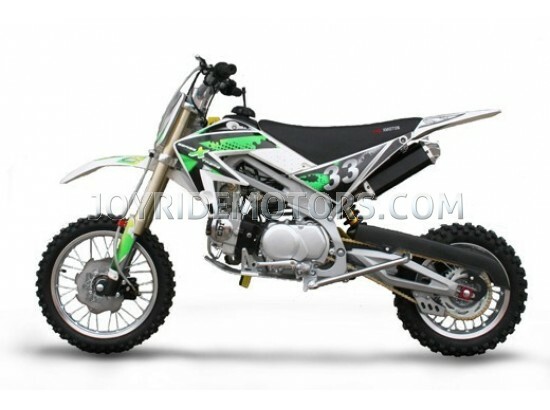 The YZ Dragon 125cc Dirt Bike for sale is an amazing value that is inexpensive but not at all cheap! 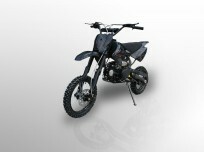 The Joy Ride YZ Dragon 125cc has sharp-looking fenders, number plates, and frame covers not found on a cheap dirt bike. 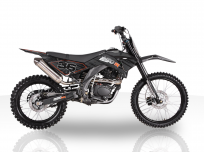 The Dragon 125cc Dirt bike is lightweight and has a strong power band that allows the Joy Ride YZ 125cc dirt bike to rise to any challenge. When you've got a Joy Ride YZ Dragon 125cc dirt bike the whole world looks a little different. You start seeing whoops, jumps, and washboards everywhere you look. 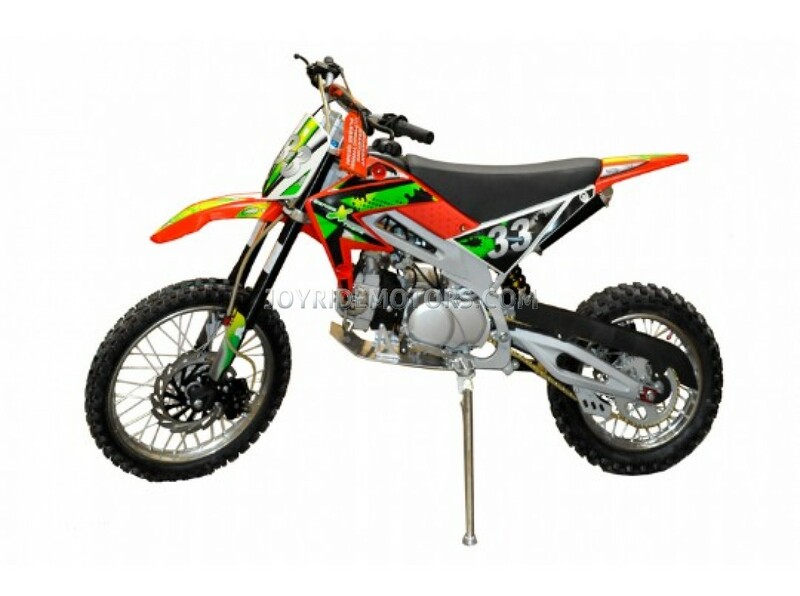 Compact and lightweight 4-stroke, 125cc dirt bike, single cylinder, air cooled engine provides extraordinary torque for awesome acceleration from idle to red line, with incredible high-rpm power. The newly designed piston, piston pin and connecting rod. The new piston is now 15 percent lighter without any compromise to strength and rigidity. If the photo's, specs and description of the YZ Dragon 125cc Dirt Bike aren't enough take a moment to ask us, or see what our customers have to say... After a decade of experience in this industry, we know you have lots of questions, so just call us at 1-877-300-8707 and we'll be delighted to answer them all :) To see what our customers have to say about us and our products, please click HERE. Were sorry but we can not ship to addresses in CALIFORNIA. THE PRICE YOU SEE IS THE PRICE YOU PAY NO EXTRA CHARGES OR FEE'S! All information is subject to change without notice. At Joy Ride Motors, we want every ride to be safe and enjoyable. So always wear a helmet, eye protection and protective clothing. Never ride under the influence of alcohol or other drugs. Study your owner’s manual and always inspect your Joy Ride before riding. Safety Message For Parents: Motorcycles are not toys. Serious injury or death can result from improper use of these products. Your youngster’s safety will depend on you taking a “Safety First” approach to riding. Even though your child may be the right age, you need to be sure that he or she has the size, strength, skills, and judgment to operate the machine safely. Ground Clearance 290mm / 11.41in. Seat Height 790mm / 31.10in. Dry Weight 79kgs / 174.16lbs. Fuel Capacity 3.5L / 0.92gal. This Vehicle has a Standard 60 Day MFG Warranty. This vehicle comes standard 60 day limited MGF (Manufacturers) warranty which covers all mechanical part failures attributed to faulty factory construction for the first 30 days, and the drive train for 60 days, through its normal and intended use from the day your receive it. Simply put, if it breaks on its own, it’s covered, but not if you break it. 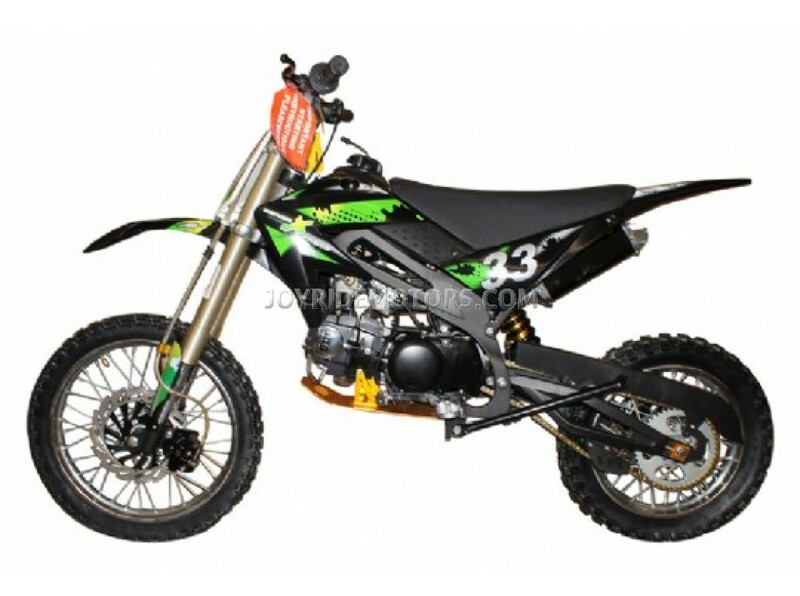 To use the policy you must follow all the procedure explained in detail under the warranty section of the this website => http://www.joyridemotors.com/warranty. The ‘Get Support’ section of JoyRides has comprehensive information about the warranty coverage of this vehicle. We encourage you to take time to read through it to assist you with your purchase decision. If you have any questions, we will be happy to answer them before or after your purchase, just email warranty@joyridemotors.com and a warranty specialist will be happy to assist you. It’s important to know that the MFG warranty is conditional and is not an offering of Joy Ride Motors. Unlike the other guys, with their “Sell it and Forget about it” attitude, we pride ourselves on great customer service, before and after the sale. That’s why we’ll gladly assist you in filing your claim should you experience a covered mechanical failure. And even if it’s not covered, we’ll still do our best to help you out and point you in the right direction to get you back up and running. At Joy Ride Motors, we believe in our products and our customers and we’ll stand behind both ... and that’s the JoyRides Guarantee! At Joy Ride Motors, we believe in the Joy of the Ride. As such we assure you that this vehicle not only complies, but surpasses, every state, federal and regulatory guideline with respect to its; manufacturing, emissions, safety features and overall construction. But proper riding, following all the rules of the road, and being alert and aware of your surroundings is not always enough to ensure your safety from other drivers or unforeseen road hazards. For those reasons, we encourage you to purchase the best riding attire, DOT approved safety gear, boots, gloves, clothing and helmets, and additional safety equipment such as windshields, vehicle locks, storage covers and more. Many of these items we sell in our Gear section. We only sell the items we feel are best on the market and for the best price you’ll find online. Please don’t risk your life and health. Make your safety and the safety o your passengers your utmost priority, as we want you to have a long and fun life... and spend much of it Enjoying the Ride. The Get Support section of JoyRides has comprehensive information on; safety, registration, licensing, warranty and insurance. We encourage you to take time to read through it. If you have any questions, we will be happy to answer them to the best of our ability, so please call 877-300-8707 or email sales@joyridemotors.com and any of our knowledgeable staff will be happy to assist you.